This was originally posted a couple of months ago, when Jobs stepped down as CEO. Steve Jobs resigned last week as CEO of Apple. There are tributes everywhere, even from his business rivals who may also be relieved. There were six articles last weekend in the Wall Street Journal alone about his achievements. In Reaping the Reward of Risk Taking over at the New York Times, Steve Lohr cites John Kao who says “The culture of other countries doesn’t support the kind of innovation that Steve Jobs exemplifies, as America does.” And there is certainly a sense in which his success was a function of both the times and the culture in which he lives. But his genius is in little doubt, and in his new role as Chairman of the Board at Apple I expect we will hear yet more from him. Still, I need to offer a little tribute of my own, even though I never camped out all night waiting for a new Apple product. In fact, few who know me would not recognize my loyalty to Apple products. But product loyalty has its boundaries. A recent study showed that brain activity when researchers showed fans pictures of Apple products was very similar to when they showed religious imagery to people of faith. A cultic following reflects human weakness more than a problem with its human object. He is not my messiah, I assure you. I’m not a fan boy. But his innovations did and do touch my life in consequential ways. So allow me to say so. First, the confession. 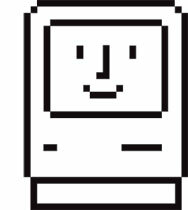 I have owned or used every variation of the Mac, including a Lisa (its predecessor) and his alternative (the NeXT) when he was exiled from the company. Even the justly maligned Cube. I use and enjoy an iPhone. I don’t have an iPod. But this endless stream of technology was from the beginning an intuitive, powerful interface that enabled my creative gifts, and whatever use of typography, design, photography, video or music I’ve made was because this interface made sense to me whenever I saw it or touched it. I’m first a writer, and I could have done word processing on a PC of course. (I did my first word processing on a TI-99.) But the Mac allowed me to visualize what it could become, how it could appear, and how—note this—it could touch my readers in visceral and emotional ways. I can sometimes do this with a well-turned phrase. But since my first Mac I could try to project that phrase with more imagination and force. Yes, I had to learn a little about design and a little about type, but the technology didn’t get in my way. It didn’t distract me or defeat me. (OK, maybe it did distract me, but good design is very seductive.) It enriched my life by making the technology I use invisible. Even magical. I worry that we miss something in hailing him as either a master salesman or a master designer, though he is clearly both. His real gift, from an early age, has been the ability to see that these two worlds could, and should, productively collide. It isn’t just that he made computers cool or put them in pretty boxes. It’s that he put those computers in new conceptual boxes. A machine originally designed for processing equations and building bombs turned out to have a wonderful hidden potential: for song, laughter, poetry, community, family. This marriage is a good thing, though not without its dangers. I’ve lost a few good student editors to graphic design. And the human heart is always prone to idolatry. But Jobs managed to recruit amazing people and together they blended cognitive science, psychology and aesthetics with technology in ways that earned Jobs himself a place in the pantheon of Edison and Ford. This displays the creative potential we share with our Maker, despite the failings or the philosophies of any man himself. I’m not siding here with his personality, his politics, his religion, or his dietary preferences. I’m just saying that since Genesis 4, since Jubal, “the father of all who play stringed instruments and pipes” and his brother Tubal-Cain, “who forged all kinds of tools out of bronze and iron,” there have been very few men who could manage both. 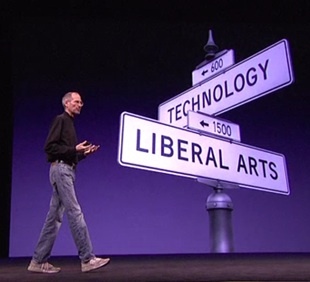 Steve Jobs was one such man and he built some tools that let more of us try. Stay hungry. Stay foolish. Steve Job’s commencement address at Standford. Previous Previous post: Go with your gut? Next Next post: can salvation be downloaded?